Pick a Pattern Washi Tape by Stampin' Up! 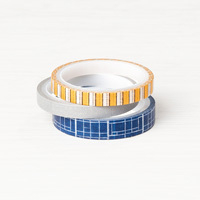 What’s to love about washi tape? Everything! The designs and colours. The versatility. The simplicity—just tear, tape, and transform. Go basic and use single strips as accents. Or step it up and combine strips to create custom backgrounds, decorations, and more. It’s an effortless way to add colour to your projects.